Most of the electric car conversion kit guides that I’ve read suggested how and where to get cheap [tag-tec]deep cycles batteries[/tag-tec]. If you are willing to spend some time and do some leg work, you can get inexpensive batteries from golf cart service shops. We know that all electric vehicle (EV) needs batteries to supply power to the electric motor. An average electric car needs about 15 to 20 units of batteries to provide approximately 100 to 150 driving miles per charge. Sooner or later, the battery is going to loose its charge. What is happening inside the battery that caused it to drop its efficiency? I’ve decided to do some research on the science of deep cycle battery. As it turns out, my copy of Convert 2 EV electric car manual has the answer. The chapter covers that topic of Battery Reconditioning. Most batteries are made up of plates inside, that when left in an undercharged state become sulfated. That means that they develop a layer of sulfate crystals on the surface of the plates. When the plates are covered by a layer of sulfate, there is less surface area in contact with the distilled water therefore reducing the flow of electric in the battery. That is why the power output from the battery is reduced. When the plates are fully covered the crystallized sulfate, the battery is literally dead and has to be replaced. Since an electric car uses so many batteries, replacing a new one can be costly. Luckily, there are ways we can remove the sulfate on the plates and bring the battery back to life. I will write another blog post next on how we can perform electric car battery reconditioning. 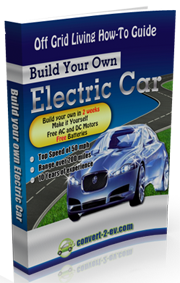 In the meantime, if you would like to know where and how to get cheap battery or recondition a dead battery to use on electric car, you can get your copy of Convert 2 EV here. I did notice that the cost of the EV shoots up cos of batteries. I am actually planning to build commercial kits which can be connected to any existing car and convert into hybrid. But at the same time, I don’t want to keep the prices high. So can you help me out or give me some practical suggestions. Instead of using dozens of bulky Lead acid batteries, I was thinking for going for lithium Ion polymer cells, but if u can suggest me something else, practical, lighter and cost efficient, it would be just great. I intend to do this for a good cause. But I need help. I think you have a great idea there. Cost wise, I am not sure if the lithium ion polymer cells are applicable for commercial usage on electric cars. Tesla uses 6831 cells cos it has a 250-300 KW motor. It is a roadster. Speed machine. Obviously it needs high powered motor and to run a high powered motor, it needs so much batteries. I am trying to find out a source where I can find these cells for cheaper price provided they can go for mass manufacturing it. But you need to help me out as how do I assemble this on to the same shaft where IC engine is transmitting to run in three modes, Electric alone, IC engine alone and both simultaneously. Also, I thought of a brilliant design to charge the batteries on the run. Not some regenerative braking or crap like that, but something more efficient. Simple and practical. But as of now, You are the one who can guide me as how to assemble this kit onto the existing system, the components required, etc etc. Can you help me with this? And btw, I am not talking bout those pen cell size Li-ion cells with 3V each. I am talking bout High Ah high volt batteries. Preferably one or max 2-3. But not more than that. Also they wont be bulky as Lead acid. I am working on that one. But I need your help. Thank for the battery reconditioning tips. I always wanted to know how to maintain and reuse old car batteries. Thanks again. No problem. Thanks for visiting my electric car conversion blog. I hope you like the articles.